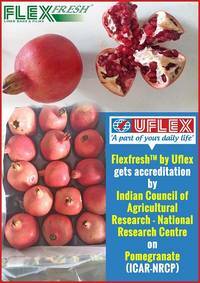 *Flexfresh liner bag by Uflex gets accreditation for Pomegranates*In a big development for the Active Modified Atmospheric Packaging (AMAP) solution by Uflex, company’s Flexfresh^TM liner bag has been accredited by Indian Council of Agricultural Research – National Research Centre on Pomegranate (ICAR-NRCP), Solapur Maharashtra. Tests were carried out with a clear protocol of comparing the shelf-life of pomegranates in refrigerated conditions. 4 samples namely Control; Wax pretreatment; Packaging in liner bag; and Wax pre-treatment and packaging in liner bag were put to test. It was observed that the control fruits (pomegranates) which had neither been wax-treated nor packaged in liner bags were acceptable only up to 30 days, on the basis of sensory score. The PLW on 30^th day for control fruits was 7.00%. The wax pretreated fruits were acceptable on the basis of sensory score up to 45 days with PLW of 7.10%. The fruits packaged in liner bag either pre-treated or non-treated with wax were found to be acceptable up to 90^th day of storage with low PLW of 4.30 and 4.36% respectively. The wax treatment improved storability of fruits by 15 days over control fruits. The fruits treated with wax and packaged in liner bag improved storability significantly by 60 days over control. Flexfresh™ is a special patented polymeric film manufactured by Uflex for offering packaging solution for fresh fruits, vegetables and flowers. In fact it is the first biodegradable (by composting) film that maintains Holy Grail of oxygen and water barrier for packaging fresh produce. Flexfresh™ while maintaining the humidity inside the bag at 98%, keeps the product absolutely dry without allowing condensation of the humidity. This results in very low weight loss of the produce as it continues to breathe in hydrated oxygen available inside the bag. In several experiments on various products, it has been observed that the ratio of oxygen and carbon dioxide has always been maintained at equilibrium. The film provides good release characteristics of CO emitted by the produce. This ensures that the produce is protected naturally from diseases such as Botrytis, Gray Mold etc. because of the high CO content. Flexfresh™ complies with all international regulations for overall migration (EC 1935/2004), reach compliance (EC 1907/2006) and qualifies for biodegradation under DIN EN 13432 (2000-12).